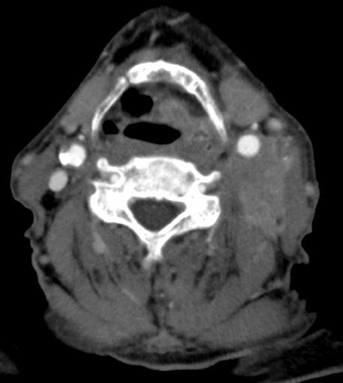 A 69-year-old male presented with a large, 5-cm, fixed left-neck mass. A biopsy identified squamous cell carcinoma and suspected left laryngeal cancer. 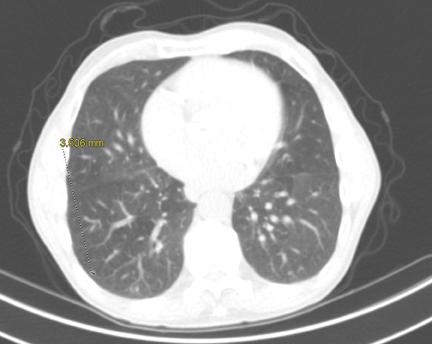 There was a question of small lung nodules on a computed tomography (CT) scan obtained at another hospital. 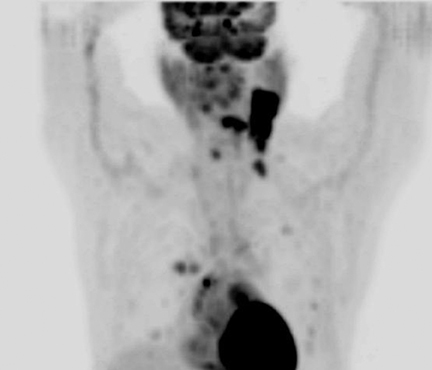 A positron emission tomography/CT (PET/CT) scan was obtained to evaluate primary neck nodes and distant metastatic lesions. 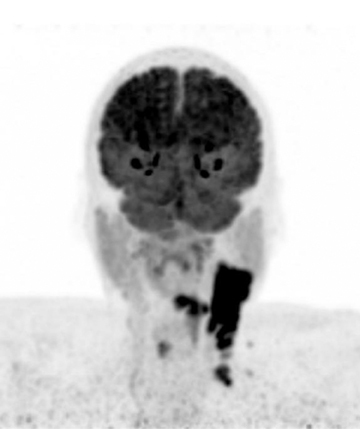 16.2 mCi of F18-fluorodeoxyglucose, 3-dimensional TOF (time of flight)imaging was obtained from the skull vertex to the lung apices and from the lung apices to the upper thighs with CT attenuation correction using a dedicated closed-ring PET system Gemini TF Big Bore. The images revealed avid uptake in the primary tumor located within the left neck and adjacent local lymph nodes (Figure 1). In addition, the images revealed PET-avid nodules within lungs (Figure 2). The presence of these nodules changed the stage of this tumor. Accurate staging depends on accurate diagnosis, and this can only be done if we can identify even the smallest foci of primary, recurrent or metastatic tumors. 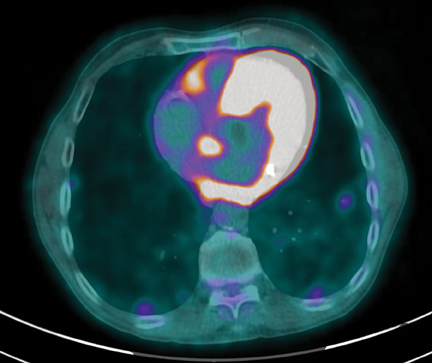 The importance of providing PET imaging is paramount to patient care. Neurology, cardiology, and oncology patients all benefit from this advanced technology. 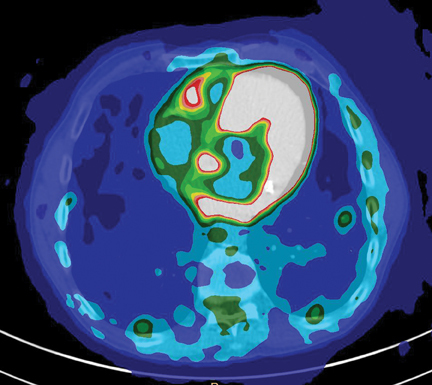 With PET imaging in oncology, we are constantly looking to improve image quality, reduce dose, and have faster acquisition times. 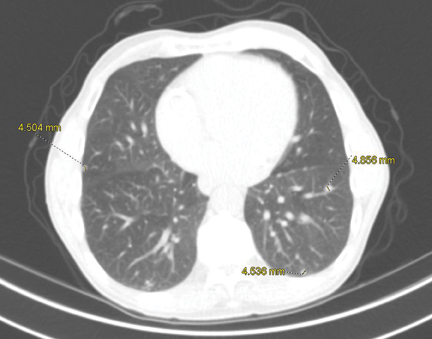 In the past, PET was not recommended for evaluation of pulmonary nodules < 8 mm in size.1 In this example, we have demonstrated pulmonary nodules as small as 3.5 mm (Figure 3). A lesion this size has < one-tenth the volume of an 8-mm lesion. Conventional PET scanners operating in 2D mode have low energy resolution and limit scattered events, thus limiting the system sensitivity by as much as 80%. Astonish TF allows us to fully operate in 3D mode, allowing higher sensitivity, therefore the ability to obtain adequate image quality with low dose.2 The Astonish TF enhances the combination of multiple reconstruction algorithms. The TOF technology allowed us to characterize small lesions that may not have been large enough to characterize on older imaging systems. 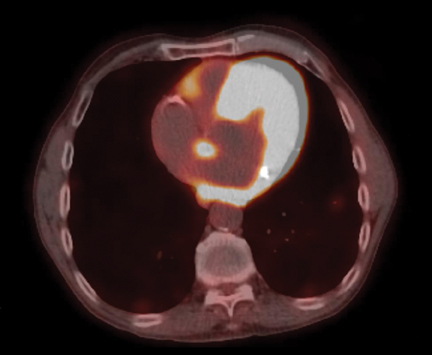 The small metastatic lesions to the lung may have been dismissed as benign, and the patient may not have been treated appropriately. Lung cancer screening: Is it worth it? Improved Lesion Detection with Astonish TF. Appl Radiol.